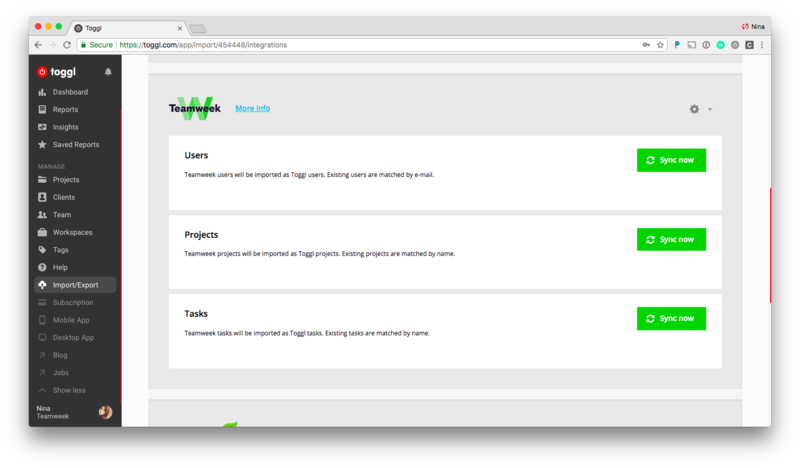 Get your productivity on by making plans in Teamweek and tracking your time in Toggl. This is a one-way integration from Teamweek to Toggl only and only Admins can set it up. Sign in/sign up to Toggl account. Go to Toggl Import page.Scroll down to Teamweek and select Enable Teamweek integration. Allow access to your Teamweek account and log in. You’ll be directed back to the Import page in Toggl. Click on the Sync button. To stop syncing either users, tasks or projects, choose Delete configuration from the Cogwheel Icon next to the Sync button. Shut down the integration: choose the same option from the lone Cogwheel Icon at the top right. Existing users are matched by e-mail. Existing projects will be matched by name. Imported as Toggl tasks. The existing ones are matched by the name. You can only import tasks from Teamweek that are attached to a project. Enabled auto synchronization from the Cogwheel Icon at the bottom left. The tool will look for new imports at least once an hour (not available for users’ import). Switch back to manual sync by clicking on the Sync button. NB! The Sync now button doesn’t trigger an immediate synchronization. It may take an hour or more. You can also track your time directly from Teamweek by installing Toggl Button Extension either from Chrome store or Firefox. Once you add it and allow the Button to have permission to Teamweek, you will see Toggl button inside your Task popup in Teamweek.